The harrowing, true account from the brave men on the ground who fought back during the Battle of Benghazi.13 HOURS presents, for the first time ever, the true account of the events of September 11, 2012, when terrorists attacked the US State Department Special Mission Compound and a nearby CIA station called the Annex in Benghazi, Libya. A team of six American security operators fought to repel the attackers and protect the Americans stationed there. Those men went beyond the call of duty, performing extraordinary acts of courage and heroism, to avert tragedy on a much larger scale. This is their personal account, never before told, of what happened during the thirteen hours of that now-infamous attack. 13 HOURS is a stunning, eye-opening, and intense book...but most importantly, it is the truth. The story of what happened to these men...and what they accomplished...is unforgettable. Kris Paronto - “Tanto” as he is affectionately known in security contracting circles - is a former Army Ranger from 2nd Battalion 75th Ranger Regiment and private security contractor who has deployed throughout South America, Central America, the Middle East and North Africa. He also worked with the US Government’s Global Response Staff conducting low profile security in high threat environments throughout the world. 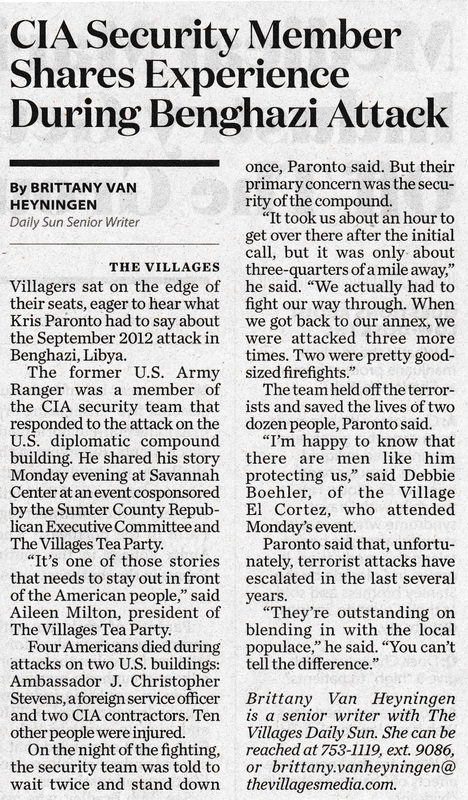 Mr. Paronto has been involved in security operations in hostile environments for over 10 years. His team’s involvement with the September 11th, 2012 attack on the US special mission in Benghazi, Libya was paramount in the saving of US lives and assets. He is a proven leader, teammate and friend to those who have deployed with him, and a devout father to three children.